204-2HD Teflon tape is a 2 mil high density tensilized pure skived Teflon™ (PTFE film) tape with a high temperature silicone adhesive that is superior to Kapton for use in Tefzel cabling and harnesses. It comes self-wound without a liner. Used in electrical applications such as harness / coil wraps & separators, transformers and slot liners where good insulation and heat resistance are required. 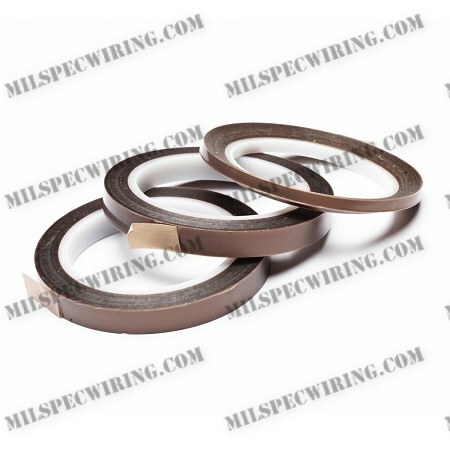 Also used in mechanical applications such as heat sealing bars & jaws, labeling machine pressure pads, chute liners, anti-friction devices, bearings, forming dies, aircraft mold release & guide rails where high temperature, maximum slip and lubricity are required. 204-2HD Teflon tape provides higher tensile strength, lower elongation and higher dielectric strength than regular skived film. It is primarily used for electrical applications listed above & for roll protection in flat die extrusion.